Harasta (Syria) (AFP) - A Syrian rebel group in Eastern Ghouta announced a ceasefire from midnight Friday, a spokesman said, after fighters and their families left under a Russian-brokered evacuation deal that is the first for the shrinking opposition enclave outside Damascus. 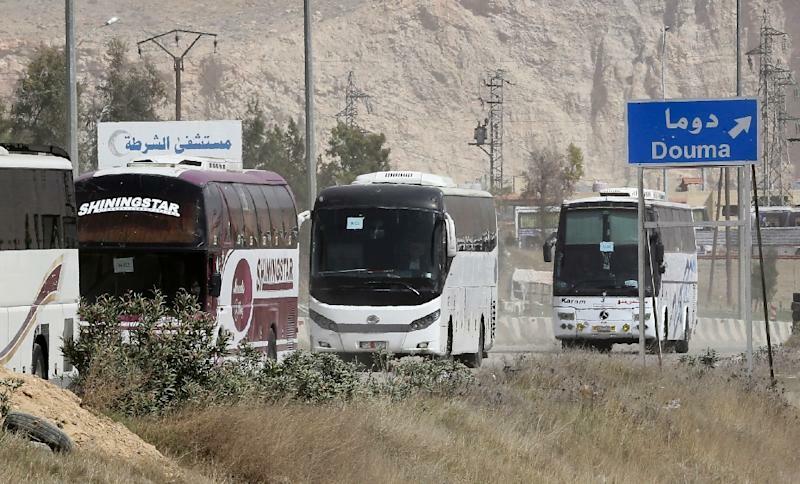 The evacuees were bussed out in the direction of the northwestern province of Idlib, after hours of waiting in a buffer zone for a green light to enter regime-held territory. In Idlib -- the last province in Syria beyond government control -- an air raid on a market killed 28 civilians, the Syrian Observatory for Human Rights said. 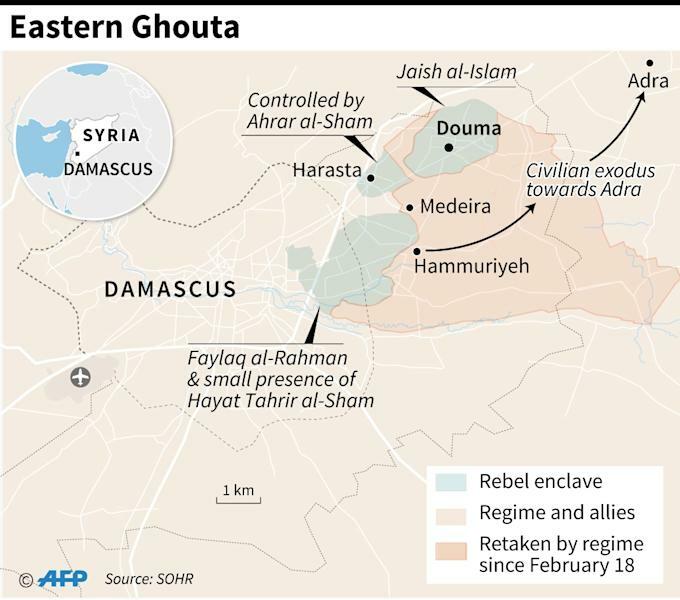 The evacuation agreement, announced on Wednesday and brokered by regime ally Russia, could empty one of three rebel-held pockets in Ghouta as government troops seek to secure the nearby capital. It could also further isolate the rebel groups that control the remaining two pockets of Ghouta and piles pressure on them to accept similar deals. It came as a spokesman for the Faylaq al-Rahman rebel group in the southern rebel pocket of Ghouta announced that "agreement has been reached for a ceasefire, through the auspices of the United Nations". The truce will permit "a final round of negotiations" between rebels and Russia, he added. The announcement was made after air raids targeted the part of southern Ghouta under the control of the Faylaq al-Rahman, leaving at least 38 people dead, according to the Syrian Observatory for Human Rights. After hours of waiting in a buffer zone, more than 1,580 people including 413 fighters left the Ghouta town of Harasta on 30 buses, state news agency SANA said, crossing over into regime-held territory. State television announced the "departure of buses carrying fighters from Harasta to Idlib". An AFP correspondent saw the buses exit the battered rebel bastion, in the first such deal since a blistering regime assault on the enclave started on February 18. Before leaving, fighters performed the evening prayer by the buses, he said. Women and children walked nearby or sat by the side of the road. Munzer Fares, a spokesman for the Ahrar al-Sham rebel group controlling Harasta, said the evacuations could last several days. The regime's offensive on Ghouta has killed more than 1,500 civilians since February 18, the Observatory says, and sliced the shrinking enclave into three isolated pockets. Rebel fire on Thursday killed four people in Damascus, state television said. The rebels and their families will be transported to the northwestern province of Idlib, which is held by a myriad of jihadist, Islamist and secular groups, many with links to Turkey. In Idlib, air strikes killed 28 civilians -- including 11 children -- in Harem, an area controlled by Hayat Tahrir al-Sham, a group led by Syria's former Al-Qaeda affiliate, the Observatory said. It came a day after an air raid on a different part of Idlib, the town of Kafr Batikh, killed 20 civilians -- including 16 children -- near a school. The evacuation from Harasta will further isolate the rebel groups that control the remaining two pockets of Ghouta and pile pressure on them to accept similar deals. Syrian Reconciliation Minister Ali Haidar told AFP that Ahrar al-Sham had negotiated with the Russian Centre for Reconciliation and that Damascus was not directly involved. Nawar Oliver, an analyst at the Turkey-based Omran Centre, said fighters in Harasta "were not able to impose a single one of their conditions". Opposition figures in Ghouta said talks were under way for a deal to evacuate rebels from the enclave's main town, Douma. Douma is controlled by the Jaish al-Islam group, while a pocket of territory closer to the capital is held by Faylaq al-Rahman with a small jihadist presence. Air strikes on Zamalka killed 16 civilians on Thursday, the Observatory said. An AFP reporter in Douma said hundreds of civilians were fleeing the town. Similar evacuation deals have seen the government retake a string of former rebel bastions. 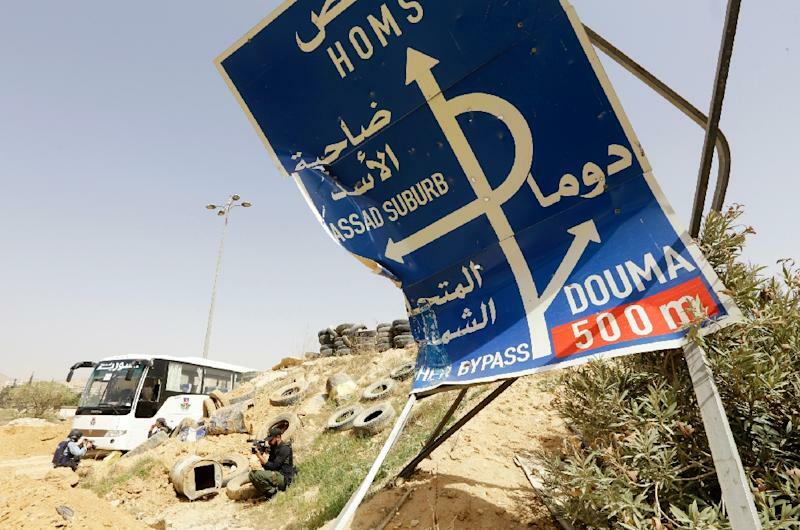 A May 2014 deal saw rebels pull out of third city Homs, once labelled the "capital of the revolution" that sparked Syria's seven-year civil war. In December 2016, the army retook the whole of second city Aleppo as rebels withdrew in one of their worst defeats of the war. Those agreements also followed devastating bombardments that took a heavy toll on trapped civilians. The assault on Ghouta has sparked a mass exodus of civilians from the enclave. Some 50,000 people have reached shelters in government-controlled territory in the past week, the United Nations says. On Wednesday, the UN's humanitarian coordinator in Syria said those displaced were living in "tragic" conditions. "People may have escaped fighting, fear and insecurity but they find themselves in a place without anywhere to wash themselves," Ali al-Zaatari said.